It's the most tech-packed Monster yet, but is it still 'unmistakably Monster'? THERE ARE a ton of bikes that I’ve never ridden and until very recently, I’d never swung a leg over a Ducati Monster. Oh, the shame of it, after all, the Monster is one of the iconic Ducatis and a bike that has every right to stake a claim as the originator of the sports naked class. It’s a class that’s come a long way since Ducti first introduced the M900 in 1993. Right now, it’s pretty unhinged. In fact, the term ‘sports naked’ has long been ditched in favour of ‘super naked’ in line with how Ducati Monster and its peers have become increasingly lairy. Now, big naked bikes are more powerful, sophisticated and focused than even before. Although they’re still a superb option if you want an exciting bike for weekend scratching, the odd track day and a fun time, they’re also more serious and capable than ever. The new Monster 1200 and 1200 S is no exception to this change and for 2017 Ducati has given it more power, a sophisticated electronics package from the 1299 Panigale, and a redesign that includes a shorter tail section and slimmer tank. 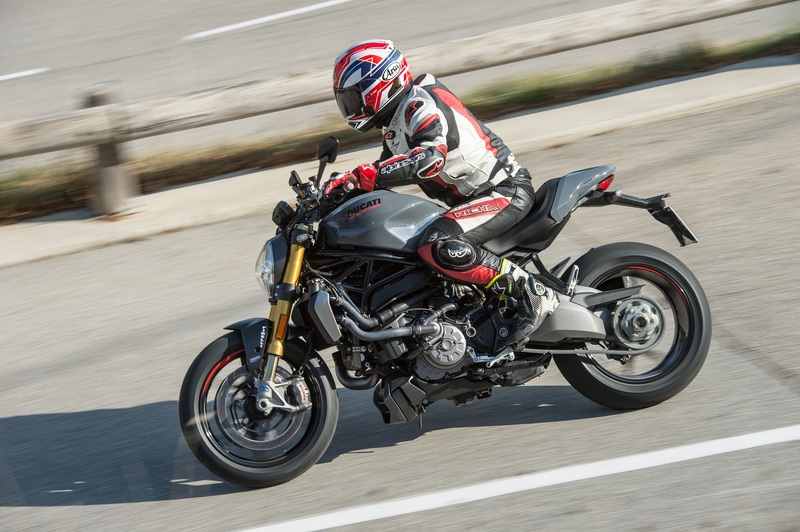 Ducati says this Monster has been given more than a facelift, but that it's still 'unmistakably Monster' and seeing as this is my introduction to the Monster, I hope they're right. The increase in power and torque comes courtesy of the latest version of the liquid-cooled 1198.4cc Testastretta 11° L-twin engine, which has a been given new throttle body inlet ducts and has had its compression ratio increased. As a result, the 2017 Monster 1200 and 1200 S now punt out 150hp and 93.1lb/ft torque; that’s 5hp more than the previous Monster 1200 S and just 10hp less than the Monster 1200 R.
That means it’s almost the least powerful European super-nekkid as it makes 10hp more than the Triumph Speed Triple but is 15hp down on the new BMW S1000R, 25hp down on the Aprilia Tuono V4 1100, while new KTM 1290 Super Duke R puts out a ridiculous 177hp. However, with 93.1lb/ft, the Monster 1200 makes a bit more torque than the BMW (which makes 84lb/ft), Aprilia (which makes 89lb/ft) and Triumph (82lb/ft). The Monster 1200 S weighs 185kg dry and during the presentation, I was told that the standard model is 2kg heavier. The S model is quoted as weighing 200.5kg wet with no fuel, so with a full tank of unleaded, it’s going to be heavier than the 205kg fully-fuelled and ready-to-rock BMW. Aprilia says the dry weight of the Tuono is 184kg. Dry weights for the Super Duke R and Speed Triple R are 195kg and 192kg respectively but it’s difficult to accurately compare these as manufacturers aren’t often clear about what/how they class wet and dry weights. But enough with the numbers; I wasn’t reciting spec sheets to myself once on the move and ‘It’s lacking a bit of power’ wasn’t a phrase that came to mind once I’d hit the road. The engine has bags of smoothly delivered torque and pulls like Wayne Rooney in an old people’s home. The torque makes itself noticeable from 3,000rpm but between 6 and 10,000rpm is where this Monster become most savage as it surges forward with the front wheel hovering over the tarmac (or floating above it, depending on the wheelie control). Without doubt, the Monster 1200’s torque is king, and although 150hp isn’t to be sniffed at, punching out of bends and using the bike’s considerable midrange shove always put the biggest smile of my face because that relentless shove is so accessible and alluring. When you add in the peachy fuelling and excellent throttle response in all riding modes (Sport, Urban, Touring), the Monster 1200’s engine is hard to fault. Complimenting the reinvigorated engine is a suite of electronics from the 1299 Panigale, so the 2017 Monster 1200 S has cornering ABS thanks to the addition of an IMU. It also boasts a quickshifter and auto-blipper as standard (a first for the Monster), along with eight-stage traction and wheelie control, plus three levels of ABS intervention. On the damp switchback roads in the hills north of Monte Carlo, the traction control performed superbly. With a lot of the roads being bumpy, dusty and having a sheer drop on one side, I wasn’t pushing my luck with the traction control but on the couple of occasions where I detected it working as I exited wet hairpins, I could feel it doing so with the utmost grace and subtley to keep the rear tyre (and overzealous rider) in check. If you’ve not used a quickshifter before, you’ve got to give one a go; they’re a lot of fun and the Monster 1200 S’s Ducati Quickshifter (DQS) is no exception. Smooth clutchless changes up and down the box are the order of the day, although it definitely worked best for me when I wasn’t pootling around. In town I preferred to change gear with the clutch as meant I could avoid the occasional clunkiness of the quickshifter’s performance at low speed. The DQS is fun because it makes riding in attack mode that little bit easier. It gave me more time to think, to plan and assess because I never had to worry about using the clutch or blipping the throttle (not that I needed to with a slipper clutch), instead I was free to focus on braking and acceleration and that makes the ride more precise and enjoyable, and makes the bike’s perrormance more accessible. While on the test ride, I had two of occasions when I was riding fast and got a few up-shifts that were laggy – like the ignition had been cut for a moment too long. Otherwise, the DQS is brilliant, although I think it requires a more positive-than-normal shift between first and second gears, otherwise it’s easy to hook neutral in either direction. Setting for the electronics are all altered using the excellent, crisp, clear colour TFT dash screen and the controls on the left switchgear. When on the move, all the crucial information is easy to see at a glance. Changing between ride modes and altering individual ride mode settings (like traction control, wheelie control, ABS and quickshifter operation) is intuitive and easy and you setting are stored for the next time you ride. Sat on a standard 'new' 1200 today at the NEC show. Very nice. Good stance as mentioned - reminiscent in a way of the much cheaper mt09. But didn't feel much different - 'newer' - than the 1200R near by. The R's not being updated - so must have already had its own rommier pegs, yes? Anyway, the 1200S especially, which does look better still, seems like a very decent bike where someone has then spent a fortune on upgrades - ohlins, better brembos. So in a way it's worth the great expense. But doesn't feel worth it. And for a monster experience, I reckon the also nearby brand new aircooled 797 or even the powerful enough 821 would be more than adequate. Why gild it even more?